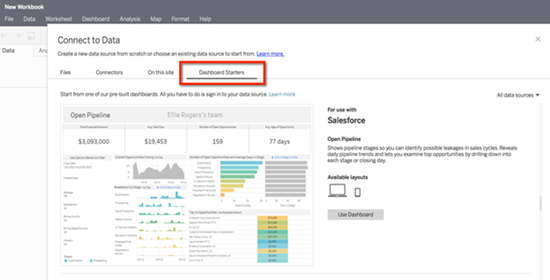 The latest release of Tableau Online includes Dashboard Starters -- pre-built dashboards for use with Salesforce, Marketo, Oracle Eloqua and ServiceNow ITSM. In this webinar recording, our Salesforce and Tableau experts do a deep dive into the Dashboard Starters for Salesforce. You’ll get an understanding of how to turn the Starters into the finished products that decision makers really need. Greg co-founded Senturus in 2001. He has been helping clients implement Salesforce analytic solutions since 2003, Marketo analytics since 2011 and Tableau visualizations and dashboards since 2014. Monica is a Tableau-certified consultant and trainer and has been delivering Tableau-based solutions for Senturus clients for over two years. Which marketing campaigns are the best revenue drivers? How much of our pipeline do we win? What’s the trend in each component of pipeline growth? Are we gaining new prospects or recycling? Look for Dimensions and Measures with a red !